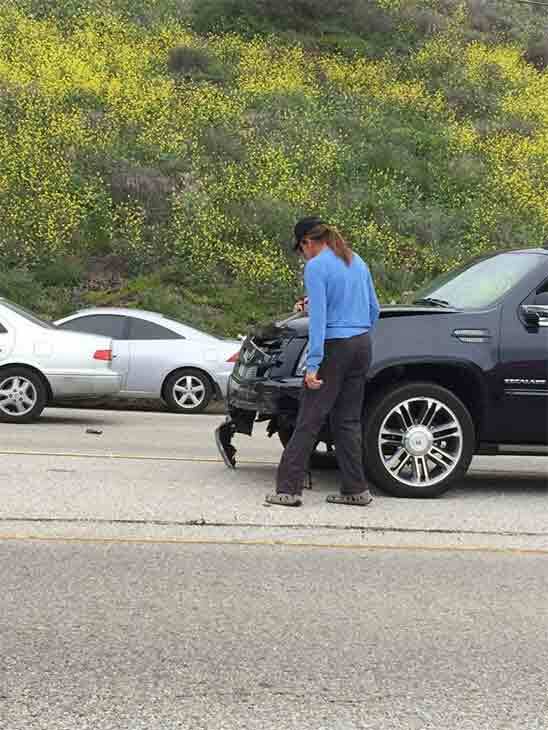 Bruce Jenner was involved in a fatal four-vehicle crash in Malibu on Saturday, officials said. The former Olympian's representative said he's doing fine. MALIBU, Calif. -- Bruce Jenner was involved in a four-vehicle crash in Malibu that killed an elderly woman on Saturday, Los Angeles County sheriff's officials confirmed. The former Olympian's representative, Alan Nierob, said he's doing fine. Authorities said an elderly woman was killed and seven others were injured in the chain-reaction crash, which occurred in the 26000 block of Pacific Coast Highway, just south of Corral Canyon Road, around noon. Those hurt suffered minor to moderate injuries. Sheriff's officials said the deadly crash occurred after a Prius came to a stop in the northbound lanes of PCH for reasons unknown. The Prius was then hit by a white Lexus sedan driven by an elderly woman. Jenner's Cadillac Escalade, which was towing a trailer, then rear-ended the Lexus. The impact of the crash caused the Lexus to travel into the southbound lanes, where it then collided head-on with a Hummer. "It appears that the Prius stopped in the lane. We don't know why," Los Angeles County sheriff's Sgt. Philip Brooks said. The driver of the Lexus was pronounced dead at the scene. Two children, two adults and a baby in the Hummer were transported to a Santa Monica hospital. Jenner told deputies he was being followed by paparazzi, but deputies said the accident was not the result of Jenner doing evasive maneuvers to avoid them. This photo from Twitter user unclenandough shows the scene of a fatal car crash in Malibu on Saturday, Feb. 7, 2015. At this time, the reality TV star is not considered at fault. Jenner allegedly passed a field sobriety test and voluntarily submitted a blood test at Los Robles Hospital & Medical Center. Brooks said he cooperated with investigators and did not appear to be intoxicated. PCH was shut down until 9 p.m. in both directions about two miles west of Malibu Canyon Road due to the crash. At about 6:30 p.m., a 44-year-old man left the Malibu Roadhouse restaurant, drove through the barricade and crashed into the wreckage, deputies said. The crash did not compromise the investigation. The vehicle was quickly removed and the driver was arrested on suspicion of DUI. "I couldn't believe it actually happened because we had the whole road blocked off," said Los Angeles County sheriff's Deputy Douglas Johnson. Meantime, investigators say they will check the cellphone records of Jenner and the other drivers involved in the fatal collision to see if anyone was using a cellphone at the time of the crash. The crash comes at a time of widespread talk that the Olympic gold medalist and Kardashian family patriarch is transitioning to become a woman. The incident remains under investigation. Anyone with further information was urged to contact the Los Angeles County Sheriff's Department, Malibu/Lost Hills Station at (818) 878-1808.